Amphibians include 3 major groups or orders of animals: salamanders (Order Caudata), frogs (Order Anura), and caecilians (Order Gymnophiona). Worldwide there are approximately 5,200 frog species, 530 salamander species, and 170 caecilian species (Global Amphibian Assessment 2006). Frogs can be found in almost any habitat type and are found throughout the world except for very dry deserts and arctic areas. Salamanders are found in a variety of wetter habitats throughout portions of North America, northern South America, Europe, northern Africa, and Asia. The highest concentration of salamanders in the world is found in the southeastern United States. Caecilians are legless amphibians that physically resemble worms and are only found in tropical areas of South America, Africa, and Asia. The International Union for Conservation of Nature and Natural Resources (IUCN) currently lists approximately 1/3 of all amphibian species worldwide as threatened (critically endangered, endangered, or vulnerable). In Wisconsin, there are 7 salamander and 12 frog/toad species (one is listed as State Endangered and two are listed as Special Concern). Many Wisconsin amphibians are found throughout the state while others have more limited ranges. With some notable exceptions, the larval stage of most of these amphibians is spent in aquatic habitats. Salamander larvae are typically carnivorous while anuran larvae are typically herbivorous. As adults however, both groups feed primarily on insects and other small invertebrates. Wisconsin frogs typically emerge from their overwintering habitats in early spring. All Wisconsin frogs return to the water to breed during fairly well-defined spring and summer breeding seasons. At breeding sites, male frogs advertise their presence to females with distinctive species-specific breeding calls. Early season breeders tend to lay their eggs in temporary ponds where predators such as fish cannot survive. These tadpoles must grow quickly so they can metamorphose before their ponds dry up in late summer. Late season breeders, such as the green frog, lay their eggs in permanent water and tadpoles may not metamorphose until the second year. 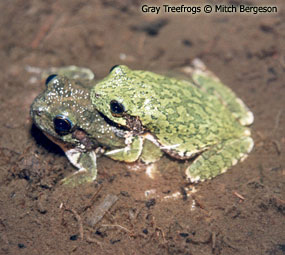 After breeding is complete, many species of frogs move into the uplands to forage, while some species, such as the green frog, mink frog, and bullfrog, rarely leave the water as adults. Amphibians are thought to be indicator species of environmental health because of their unique and complex lifestyles. The majority of amphibians spend a portion of their life in the water and a portion of their life on land, exposing them to multiple aspects of the environment. Most anurans are herbivores as larva and carnivores as adults, placing them at varying levels of the food chain. The permeable skin and eggs of amphibians are often highly susceptible to contaminants, UV radiation, and other environmental factors. Amphibians also typically have relatively small home ranges and limited dispersal abilities, limiting their ability to adapt to many environmental alterations. Amphibians are the most abundant vertebrates in many ecosystems; their disappearance would have profound effects on the remaining species and the overall health of the ecosystem. Amphibian populations throughout the world have been declining since at least the 1970's for unknown reasons. It is currently estimated that 43% of all amphibian species worldwide are experiencing declines (Global Amphibian Assessment 2006). There is little geographic or taxonomic pattern to the reported declines and declines have occurred in degraded areas as well as pristine locations free from local anthropogenic disturbance. Habitat alteration, chemical contamination, UV radiation, disease, climate change, and exotic species introductions have been associated with specific amphibian population declines in some locations, however the majority of declines remain unresolved. Although there is still debate as to whether all declines are the direct result of anthropogenic activities or if some declines are simply natural fluctuations, habitat destruction and alteration are considered the most serious threats facing amphibian populations today. Recent widespread declines in amphibian populations are especially disturbing because of the role of amphibians as indicator species of environmental health. Malformed amphibians, particularly frogs, began to be reported worldwide in apparently larger than average numbers in the 1990s when a group of students observed numerous northern leopard frogs with malformations at a local Minnesota pond. Natural malformation rates are estimated at 1-3%, however many populations have been found with up to a 70% malformation rate. Malformations may include missing limbs, additional limbs, missing eyes, and malformed limbs. Internal malformations also occur but are not as easy to identify. Malformed amphibians have been reported in 44 states, affecting approximately 60 species (North American Reporting Center for Amphibian Malformations 2006). In Wisconsin, malformed frogs have been reported in at least 41 counties, affecting at least 7 seven species. Reports of amphibian malformations have further heightened concern over the health of amphibian populations. Determining the nature, extent, and causes of amphibian population declines and malformations is unfortunately hampered by a lack of long-term population data. Long-term data are a necessity when studying amphibian populations because amphibian populations naturally fluctuate annually. There is clearly a need for a coordinated system of research and monitoring that will determine and characterize significant population trends and identify causes (Blaustein and Wake 1990, Pechmann et al. 1991). This includes long-term population monitoring for a large number of species over wide areas that will identify changes in geographic ranges and distinguish regional and long-term trends from those that are local or short-term. Such a monitoring system could alert researchers and managers to species and regions in need of attention, and suggest patterns or causes of declines. For anurans, which advertise their presence during the breeding season with species-specific vocalizations, breeding call surveys, such as those used by the WFTS, are recommended for surveying numerous anuran populations across large areas. Blaustein, A. R., and D. B. Wake. 1990. Declining amphibian populations: a global phenomenon? Trends Ecology and Evolution 5:203-204. Global Amphibian Assessment. 2006. Global amphibian assessment webpage. http://www.globalamphibians.org. North American Reporting Center for Amphibian Malformations (NARCAM). 2006. North American reporting center for amphibian malformations webpage. http://frogweb.nbii.gov/narcam (inactive). Pechmann, J. H. K., D. E. Scott, R. D. Semlitsch, J. P. Caldwell, L. J. Vitt, and J. W. Gibbons. 1991. Declining amphibian populations: the problem of separating human impacts from natural fluctuations. Science 253:892-895.